Passive Or Active – Which Voice Are You? Passive voice. It’s proving to be a ball and chain for writers new to the fiction game. In fact, it remains a problem for some of the more ‘experienced’ authors, too. I should know – I was one of them. So, what exactly does passive voice and active voice mean? Basically, writing in ‘passive’ voice not only sounds awkward, it means more words are needed to make your sentence. Active’ voice, on the other hand is clear and will keep your writing tight. But how can I tell the difference between the two? “Tracey made the bed” is active. Tracy (subject) made (doing the action) the bed (object). “The bed was made by Tracy” is passive. The bed now becomes the subject and the focus of the sentence, but it isn’t doing anything. It has now become the recipient as it’s being made by Tracy. The whole sentence is reversed. “The door was kicked in by the officers.” This is passive writing. We have our subject (the door) not doing anything but being on the receiving end of the officers boot. Wouldn’t it sound better if it was worded, “The officers kicked in the door”? – Subject (officers) doing the action (kicked) to the object (door). So is passive writing a big ‘no-no’? ‘Hell No!’….if you are a politicians or news reader and don’t want relay certain information to their public, either because you don’t know it or you are just secretive. But, as we are talking fiction writing, my answer would have to be a ‘Hell Yes!’ It is a sure way and agent or publisher can tell if you are a novice writer or not. But how do I know if I am writing passively? Well, look at your sentence. First, is your subject doing the action? Have you mentioned the object? Another indication that you are writing passively is your choice of words. Was, were, are, is, am, being, been all denote passive writing. Also, how many words do you have ending in ‘ing’? Too many I bet. I was a classic passive novelist when I first started writing. I had a friend point it out to me and voila. Now I’m an active girl. If you stick to SUBJECT – DOING ACTION – OBJECT, and watch your verbs, you’ll be fine. So, are you a passive writer or an active writer? Did you even notice you were writing in passive voice? Do you have any other tips for new writers? Let me know your thoughts….you know I like to chat. This is the first time I’ve ever seen the distinction between passive and active explained. Thank you, now I know the reasons my word processor says that, and when to ignore it. There is a slight problem with the last two examples; they change the tense of the sentence. For most authors, using the present tense is something that just doesn’t happen, but there are the odd-balls who do. Anyway, thank you. I’ll keep this explanation in mind as I write from now on. Ha ha ha. I just saw a mistake I made. The last two examples are not present tense. So that means my example is wrong. A good post was written by you here. Hmmmm. Awkward that sounded. Reworded I guess it should have been. David, I understood it – what does that say about me? Post-it up, great advice, Donna. Gene, I have post stick notes EVERYWHERE! When I teach passive and active voice, I use the terms agent, action, and victim. So in the sentence “The dog ate the shoe,” the agent is the dog, the action is eating, and the poor old shoe is the victim. In a passive sentence, the victim is the subject. So that same sentence in passive voice is “The shoe was eaten.” The agent can disappear, or get tacked on the end in a prepositional phrase. There are good reasons to do this, too! If the victim is the important part of the idea, it makes sense to privilege it over the agent: “School got canceled today!” is communicating that particular lazy brand of joy much more effectively (and realistically) than “The principal canceled school today.” Because no one cares about that poor old principal getting up at the crack of dawn to look at the snow; they care about sledding! We tend to hate on poor old passive, but it does have its uses. 🙂 What else could he being doing on that mat? I wish our kitten would sit on the mat. She’s like Kato from the Pink Panther films. That’s why we called her Sky cos she’s always up in the air lol!!! Ahhhhhh, where were you when I created my first tragic waste of trees. The passive voice is used in engineering, technical writing and so on. Which is my excuse for writing my entire first book in it. But, as I can already hear you say, voice wasn’t its only problem 🙂 For me the passive voice leads to telling and not showing, but maybe that’s just me. An easy way to spot the passive voice is sentences containing a form of “to be” and a past participle. As you said, forms of “to be” are: is, are, am, was, were, has been, had been etc, and most past participle’s end with “ed.” (eg in your second example “was kicked”). There, a whole comment and nothing rude at all! Just so you all know, this writing thing is a total and complete scam. You actually pay them to be on the “list”, something like $42 a month, and then they MIGHT throw you a bone every now and then. I didn’t learn this the hard way. I researched it. Oh, what did I do to receive a compliment like that? It was a compliment, wasn’t it? An example of passive voice that still works. Oh, I’m sure it would be sweet to be loved by you also. Some guy will be, or is, very lucky indeed! Is, as it turns out. Okay, must be serious, darn. This was a great post Donna. I, like so many others used so much passive voice in the beginning. I sometimes can’t believe how much new writers make the same mistakes. It’s crazy. Beyond the excellent points you made, in general, it’s better to be active than passive. Thanks for a fine post! 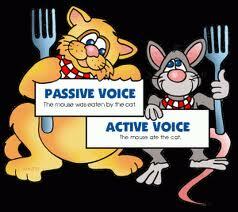 Great explanation on passive vs. active voice. It’s something I’ve put a lot of work into and have improved on, but that stage of my writing is still a WIP, lol. Thanks for the examples and the “subject is doing the action to the object” is excellent! Thanks Stacy. Like I said to Karen, I used to be the Queen of Passive Writing. I think every new writer has to go through it, lol.